Geoffrey Grigson, who didn’t much like female poets, was less hard on HD (Hilda Doolittle ) in his review of Peter Jones’ Penguin anthology of Imagism than he was on some of the male contributors, particularly F. S. Flint. Was it because she was a a looker, albeit a lesbian, or was it ( more likely ) because—despite despising Imagism as a minor movement in poetry , he rather admired her work—or at least her very early work. Most people now regard Doolittle as the best of the Imagists, or least as the poet who was most committed to the principles of the movement ( economy and precision in poetic diction ) as promulgated by Pound and others. Richard Aldington, to whom Doolittle was unhappily married for a short time also began as a devotee, but like the other early adherents, soon strayed off the narrow path and ended up rather prosy. 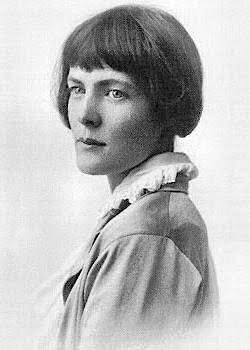 Doolittle, in contrast, took her role very seriously and continued as a strict imagist for several decades of her long writing life, publishing several slim volumes long after Imagism had gone out of fashion, before at last turning to more conventional verse and to commentaries on wider literary issues. To many today, she remains a feminist icon. The five most important Imagists—Pound, HD, Aldington, Flint and Amy Lowell—are all worth collecting, but Doolittle, Pound and Lowell, are more in demand than the others. But look for her very earliest poems. 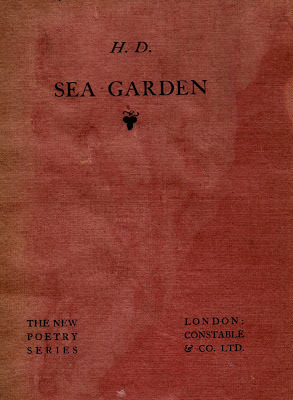 Some appeared in Des Imagistes (1914) and Some Imagist Poets (1915), which are both pricey. A copy of the former is listed at $420 on ABE. She also contributed to Coterie (1919), copies of which can change hands at between $30 and $140, and The Egoist, which because of its other big names, sells easily for more than $100. Doolittle’s rare first book, Choruses from Iphigeneia in Aulis (1916), is a translation, and as such is naturally in less demand. In Ahearne’s Book Collecting (2000) it comes in at $450. Ahearne has the issue of Sea Garden in crimson paper covered boards at $500, but copies on ABE hover around £200, with the rarer green variant at around $850. However, I recently bought a crimson copy on ABE with slight damp damage to its boards for a ridiculously cheap £20, which is only slightly more than a modern reprint. Doolittle’s second collection, Hymen (1921), is described as ‘ very scarce ‘ by one dealer on ABE, who wants $200 for his copy, and Heliodora (1924), the third collection, attracts a price of $280 from one dealer, although other copies come in at very reasonable $46 and $86. These are all fragile items and are often offered with minor damage. The remaining volumes of original verse are less collected, though one dealer demands $100 for a copy of Red Roses for Bronze (1929 ), which seems steep. Doolittle's marriage to Aldington seems to have gone pretty well until WWI. Aldington joined the army and served well enough to win an M.C. while Doolittle went to Cornwall and got tangled up with D.H. Lawrence and his friends, mainly pacifists or uninterested in the war, and had an affair and daughter with the composer Cecil Gray. I've always thought Aldington another war casualty. Except for the hate-inspired masterpiece Death of a Hero- an attack on everything and everyone in prewar England- none of his later work fulfilled his promise and he seems tohave goneout of his way to make enemies whenever he could.